Professor Woodruff is the Dean and Associate Provost for Graduate Education in The Graduate School at Northwestern University. 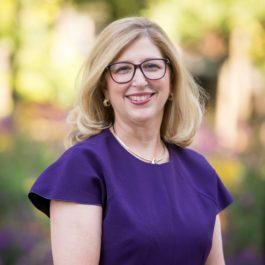 She is also the Thomas J. Watkins Professor of Obstetrics & Gynecology, the Vice Chair for Research and the Chief of the Division of Reproductive Science in Medicine in the Department of Obstetrics and Gynecology, Feinberg School of Medicine. She is Professor of Molecular Biosciences in the Weinberg College of Arts and Sciences, and Professor of Biomedical Engineering in the McCormick School of Engineering. She is the Director of the Center for Reproductive Science (CRS), Founder and Director of the Women’s Health Research Institute (WHRI), and Director of the Oncofertility Consortium. She is an internationally recognized expert in ovarian biology and, in 2006, coined the term “oncofertility” to describe the merging of two fields: oncology and fertility. She now heads the Oncofertility Consortium, an interdisciplinary team of biomedical and social scientist experts from across the country. She has been active in education not only at the professional level but also with high school students.